If all goes well, this post, which I am writing in early December, will appear as if by magic in my blog on Christmas Day in the Morning. As I explained in an earlier post, I am to recommend two books for Brian Joseph, c/o Babbling Books. The first I have chosen because I love it (although I hope that admission doesn’t prevent Brian from panning it, should he disagree!) and can’t for the life of me understand why it’s so little known; and the second I have chosen because although I think it is the work of a very original and remarkable talent, I don’t think I really understood it, and would be pleased to have, as it were, a second opinion. There’s a very interesting review of it here. Well, I’m offline till some time in the New Year. See you all then. I shall now start on my customary end of year break, and so, apart from a post already written and due to appear on Christmas Day, I do not expect to be posting till some time in early January. So may I extend my warmest festive greetings to you all. To all who are Christians, or who aren’t but are happy to receive Christian greetings, may I wish you a very merry Christmas. To all others, may I extend my best wishes for the festive season. And to everyone, may I wish a happy and peaceful New Year. 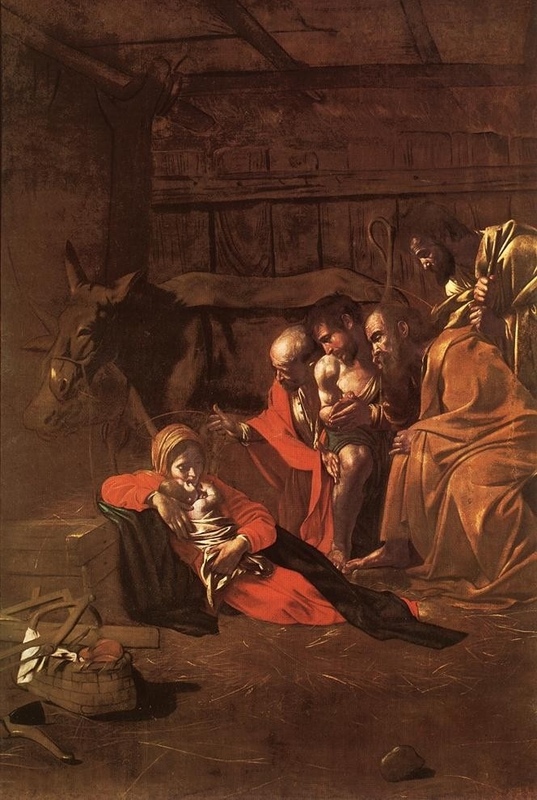 And may I finish this year, blogging-wise at least, with this very beautiful late painting by Caravaggio of the Adoration of the Shepherds, on display in in the Museo Nazionale in Messina. As I mentioned in an earlier post, Caroline (Beauty is a Sleeping Cat) and Delia (Postcards from Asia) have very kindly organized the inter-blog event “Dickens at Christmas”. I have written two posts (here and here) as contributions to this. And today is a “readalong” of A Christmas Carol. It’s part of my Christmas tradition to read this every year. I think I can safely answer “yes” to that! Sorry about this, but there are at least three scenes I must mention. The first is Christmas dinner at the Cratchits’ house: some find this sentimental, but I don’t. Dickens believed in human goodness, and here, we see a convincing picture of people who actually love and care for each other. The next scene I should mention is the other scene set in the Cratchits’ house: this is set in the future, after their child has died. Scrooge had asked the Ghost of Christmas to Come to show him some real human feeling, some “tenderness”: and here, we get it. This is an utterly convincing depiction of how people grieve for those whom they have loved. (Incidentally, at the very end of Dostoyevsky’s The Brothers Karamazov, Alyosha makes a speech at after the funeral of Ilyusha, and this speech is a very close reprise of what Bob Cratchit says to his family at the end of this scene in A Christmas Carol.) And finally, I must mention that scene where the Ghost of Christmas Present shows Scrooge those two hideous children, and when Scrooge asks whose children they are, replies “They are Man’s”. It’s a scene that still horrifies me: no sentimentality here. I love every line of this novella. All in their different ways are interesting, and vital. But if I had to choose, I’d go for the Ghost of Christmas Yet to Come. It starts with a glimpse into the abyss: we are shown a world devoid of human feeling, of human love. This is, indeed, Hell. If there is joy at the end of this story, this joy is hard won: it had required a glimpse into the abyss. (Previously, I had mentioned Dostoyevsky’s debt to this novella, but Tolstoy too was indebted: there is a scene in A Christmas Carol where some business associates of Scrooge talk about his death in indifferent and uncaring terms; this scene reappears at the start of Tolstoy’s The Death of Ivan Illych.) And then, of course, when Scrooge, in despair, begs to be shown some evidence of human “tenderness”, the Spirit obliges. Whatever anguish the Cratchits are going through, they are not in that Hell in which human feelings don’t exist. I think we are told as much about each of the characters as we need to know. Wonderful. It is a joyous ending, and this being Dickens, the joy is expressed in whimsical terms. But the joy has been very hard won. Literally, no: this is intended as a fairy story. But psychologically, and morally, yes. Scrooge is obviously a caricature, so no, I don’t know anyone exactly like him. But there are people aplenty who think that paying their taxes is enough, that they don’t need to consider those in society who are less fortunate. (Some even stop short of paying taxes!) There are people aplenty who feel that following the rules of business is enough (“Mankind was my business!” says Marley’s ghost). I still hear people speak of the “surplus population”. The depiction of Scrooge still hits home- very strongly, I think. Often, to my shame, I can find elements of Scrooge in myself also. Yes. Scrooge’s redemption comes through his own effort. It is not a gift. Many thanks to Caroline and to Delia for arranging this. A Christmas Carol was a hard act to follow. Festive season, human suffering and redemption, spirits guiding humans, supernatural visions, all leading to warmth and cheer at the end …yes, these are all present and correct; but somehow, that imaginative spark that had lit A Christmas Carol isn’t really there. Of course, one can’t merely repeat oneself: so, instead of Christmas, Dickens focussed on the New Year; and instead of the Spirits of Christmas Past, Present, and Yet to Come, Dickens gave us the spirits of the Chimes, the church bells that mark the passing of time. Or there’s Alderman Cute’s friend, Mr Filer, who has the entire world reduced to statistics, and can prove to Trotty Veck that in eating the small piece of tripe his loving daughter has brought him for lunch, he is, in effect, taking food out of the mouths of hundreds of others. Or Sir Joseph Bowley, the Poor Man’s Friend: he, good man, clears his accounts and settles his debts before the end of the year, and can only disapprove of the likes of Trotty Veck who is sufficiently improvident to be behind in his rent. What can be done with such people? Born bad, they are, born bad. These caricatures are crude, admittedly, but they have about them a certain vigour: the very real anger in Dickens’ voice is unmistakable. This is not mere social commentary: this is Dickens’ passionate anger at the inability of humans to feel each others’ woes, his anger at the human readiness to condemn without understanding, without compassion. This anger, powerful as it is, seems to drown out everything else. Dickens’ characteristic sense of whimsy seems to go missing somewhere along the way: he seems too angry to care much about such matters. The moral purpose overrides all: the story is too close for comfort to a sermon. To our modern sensibilities, of course, a sermoniser is about the worst thing a writer could be. But perhaps some sermons are worth hearing: much depends, of course, on the extent to which the reader likes Dickens’ voice, but for me, he carries it off. Even if only just. The theme is soon introduced of suicide. Trotty Veck reads of an impoverished woman who has murdered her own child and thrown herself into the river; and he reflects, once again, that he and his class are simply born bad: there can be no other explanation for so hideous a crime. But that night, New Year’s Eve, he is drawn by the chimes up into the church tower. And the spirits of the chimes show him visions of the future. In this future, he, Trotty, is dead; he had fallen off the church tower one New Year’s Eve when he had been sleep-walking. And this future he is shown is grim indeed. Promising young men turn to alcohol, and become hopeless drunks; beautiful young women turn to prostitution. And , in the final terrible vision, Trotty sees his own beloved daughter driven by desperation to commit that most hideous of crimes – infanticide, and then suicide. Our modern taste may not take too well to sermonising, but it could be that, at times, it’s our modern taste that is at fault: this is powerful, passionate stuff. The story ends happily, of course – or, rather, as happily as possible given that the people in the story remain poor, and, indeed, still on the edge of starvation. Dickens was maturing as a writer: there is no benevolent Mr Pickwick or the Cheeryble Brothers or even the reformed Scrooge who can put everything right by throwing money around. Life is dark, and will continue to be so. Under the circumstances, it is perhaps understandable that the good cheer at the end is somewhat muted. A Christmas Carol it ain’t: that extra turn of genius that has made that earlier work into perhaps the most potent of modern fairy tales is not really to be seen here. What has replaced it is a tremendous sense of anger, of passion; and also a deep sorrow in the contemplation of the depths to which humans sink. Most readers who love literature would, I’d guess, have, some time or other, imagined themselves as writers. Well, Dear Reader, imagine yourself a writer now. And imagine that you are creating a location in your novel that is dark and desolate, filthy and poverty-stricken and diseased. What appropriate name would you give it? Something like, say, Acacia Gardens would certainly be out of place, unless one is trying one’s hand merely at heavy-handed sarcasm. I suppose I would come up with something like Barebones Alley: readers possessing richer imagination than mine would, no doubt, come up with names more richly imaginative. But I doubt anyone would be able to come up with Tom-All-Alone’s. Once you hear it, you realise that this has to be the name – that nothing else will do: that this name alone removes the location from a mere physical hell-hole into some region set deep within the dark interior of the mind itself. But who else other than Dickens could have thought up such a name? The fictional world of Dickens had always presented us with a stylised version of reality – grotesquely disfigured either for comic purposes, or to inspire horror: the mirror it holds up to nature is a distorting mirror. But in Bleak House, these distortions create an effect new in Dickens – and new, I think, in any fiction: it gives us access to a world that is not merely physical. But it is difficult to describe the exact nature of this world. Psychological? Metaphysical? Perhaps. Dickens does not describe Tom-All-Alone’s in physical detail, as, say, Zola might have done: he gives us instead a powerful sense, an impression, of the desolation of the place, of a degradation of the soul that is more than merely physical. It strikes terror to the very heart. Similarly with that famous opening chapter, describing the fog: what we get is not so much a description of the fog, but, rather, a sense of something far more overwhelming, and all-embracing. The fog of wintertime London soon envelops the entire novel. And similarly with the filth: the mud on the streets almost immediately becomes transformed to “M’Lud” of the law-courts. Words themselves become malleable: later in the novel, the hospital becomes “horse-spittle”; the inquest becomes “inkwhich”; and the little boy Jo, whose horizons have never extended beyond the degradation of Tom-All-Alone’s, knows “nothink”. All literature is constructed, after all, out of language, out of words, and it is hard to think of any novelist other than Joyce who took such delight in transforming language, distorting it as he distorts reality itself, for expressive ends. The scene is London. Michaelmas Term is lately over, and the Lord Chancellor is sitting in Lincoln’s Inn Hall. The November weather is implacable. There is as much mud in the streets as there would have been if the waters had but newly retired from the face of the earth, and it would not be wonderful to meet a Megalosaurus, forty feet long or so, waddling like an elephantine lizard up Holborn Hill. Smoke is lowering down from chimney-pots, making a soft black drizzle, with flakes of soot in it as big as full-grown snow-flakes — having gone into mourning, one might imagine, for the death of the sun. Dogs can be seen in the mire, undistinguishable from each other. The horses are scarcely better; they are splashed to their very blinkers. Foot passengers are jostling one another’s umbrellas in a general infection of ill-temper, and losing their foot-hold at street-corners, where tens of thousands of other foot passengers have been slipping and sliding since the day broke (if the day ever broke), adding new deposits to the crust upon crust of mud, sticking at those points tenaciously to the pavement, and accumulating at compound interest. Every point where a “correction” has been made dilutes the effect absurdly. One may set oneself an exercise to re-write this passage in any way one wants, and we would see merely the same dilution. Dickens’ idiosyncratic syntax, his choice of words and images, are all so precise, so carefully calculated, that not the slightest detail could be changed without weakening the whole. And it continues like this for page after page. It is a virtuoso piece of writing that sets the scene of the novel – and not merely in physical terms. It presents a deep gloom and an almost primeval murk out of which the characters eventually emerge. And it is quite not a real world they emerge into: it is a world in which metaphor can become reality – a world that can accommodate even a death by spontaneous combustion. This world is dominated by the law-courts, and, in particular, by the Jarndyce vs Jarndyce case. It has dragged through the courts for generations, and there is still no sight of an end. Nobody really knows what this case is about. It has brought in its wake suffering and madness and death. There are documents a-plenty, but there isn’t time enough in the world for anyone to go through all these documents, and get to the bottom of it all. And in any case, these documents are in the possession of Krook – he who is later visited with spontaneous combustion – who cannot read. All of these seem like symbols in search of interpretations, but, as in the works of Kafka (who was surely the spiritual heir of Dickens), they seem to embody a mystery that is greater than the sum of all possible interpretations. It is a world that simultaneously invites and defies interpretation. Indeed, the very issue of interpretation seems to be at the heart of it all. Miss Flite, a woman driven mad by the case of Jarndyce vs Jarndyce, awaits the judgement of the court. And, once again, we are not merely talking about the physical: “I expect a Judgement”, she says, “on the Day of Judgement”. And on that Day of Judgement, she will release all her caged birds. She names these birds in a monstrous Rabelaisian list: “Hope, Joy, Youth, Peace, Rest, Life, Dust, Ashes, Waste, Want, Ruin, Despair, Madness, Death, Cunning, Folly, Words, Wigs, Rags, Sheepskin, Plunder, Precedent, Jargon, Gammon, and Spinach.” As ever, Dickens was a man in love with words, and the sheer linguistic plenitude of this list, words toppling over one another in mad profusion, opens the door to a world that appears, like Miss Flite herself, to have lost its sanity; a world that is simultaneously terror-stricken and absurd – a world that is, by the end, merely “gammon and spinach”. This gammon-and-spinach world is presented to us through two very different but intertwining voices. There is the voice of Esther Summerson, principled and courageous but also mannered, and, to many readers, self-satisfied and coy; and there is also an impersonal, third-person voice that we hear at the very start of the novel, speaking throughout in the present tense. Esther is illegitimate: she has grown up having had it hammered into her head that her very existence is an abomination. She finds herself ward to the kindly Mr Jarndyce, a man, who, for all his benevolence, is subject to bouts of such extreme depression that he has to shut himself away into what he calls his “growlery”: Esther is grateful to him, not merely for his adoption of her, but also for the love he offers. Indeed, so starved has she been of love, that any expression of affection she encounters she cherishes. And she tries her utmost to bring order into the world around her. But even as she congratulates herself for doing so, the other voice presents us with a world in which no order can ever be established. Esther’s view of the world is, necessarily, a limited one, and her narrative is only partly reliable: that other voice that counterpoints hers gives us a somewhat different perspective. I know of no moment in all of fiction more chilling than that when another of Jarndyce’s wards, Richard Carstone, disappears from Esther’s narrative and appears in the other. It is up to the reader to balance the different perspectives, to judge between the different voices. And it is up to the reader also to piece together the very many seemingly disparate elements of the narrative. For, amongst other things, Bleak House is also a detective novel – possibly the first of its kind: Dickens presents us with a bewildering maze of different characters and different milieux, and challenges us to find the connections. These connections, though intricate and well hidden, are very closely plotted. And the reader has to work at it: there is no Poirot to give us a lucid exposition at the end of this immensely tangled web. The character who comes closest to untangling the web is a comic character – Guppy, the legal clerk, in love with Esther and determined to unearth the mystery of her birth. By the time he is close to the solution, Esther herself has come to know it, and this knowledge, she realises, is a terrible secret. With commendable moral integrity and sense of purpose, she instructs Guppy not to enquire further; and the truth she now knows she does not reveal to anyone – not even to her trusted guardian Mr Jarndyce. But there are other wheels already in motion over which Esther has no control: the order she brings to the world can only be limited. There is also the lawyer, Tulkinghorn. He is lawyer to the crusty old aristocrat Sir Leicester Dedlock. Out in the stately home of Chesney wold in Lincolnshire, Lady Dedlock is bored; Sir Leicester, on the other hand, is never bored, for “when he had nothing else to do, he can always contemplate his own greatness”. But when Tulkinghorn presents him with legal documents, Lady Dedlock, for all her immense self-composure, nearly faints. Sir Leicester is solicitous for his wife’s health, but attaches no particular significance to this; Tulkinghorn, however, is more suspicious: he knows what has brought on Lady Dedlock’s discomfiture – the handwriting on the document. So he, like Guppy, starts digging. The servant shrinks into a corner — into a corner of that hideous archway, with its deadly stains contaminating her dress; and putting out her two hands and passionately telling him to keep away from her, for he is loathsome to her, so remains for some moments. Jo stands staring, and is still staring when she recovers herself. “I don’t know nothink of consequential ground,” says Jo, still staring. Or there’s Mrs Jellyby, unconcerned with her own chaotic family (whom she leaves to take care of themselves), but obsessed with charity, though not out of love: love is a concept alien to her; but, rather, out of a desire for self-aggrandisement. Or the loathsome loan shark Smallweed. Or the demented Miss Flite, with her cage of captive birds. The sinister lawyer Tulkinghorn. The boisterous Mr Boythorne. And so on. Perhaps no other novel, not even by Dickens, is so full of such a vivid gallery of characters, for whom the term “caricature” seems somehow inadequate: these grotesques, for all their grotesqueness, are living people. Even Sir Leicester Dedlock, the contemplator of his own greatness: when the truth is revealed, and the assumptions on which his entire life had rested disintegrate, he can redeem himself morally – and, hence, take on a tragic dimension – by forgiving. But this moral redemption does not, can not, bring him happiness, or even help salve his wounds: we are far here from the simpler world of Dickens’ earlier novels in which goodness resulted in happiness. But it does allow Sir Leicester to develop into a character possessing nobility, though not the nobility that Sir Leicester had previously imagined for himself. When he had thought himself noble merely on account of his birth, he was but a caricature; but when his entire life collapses, he becomes real. Ordinary caricatures do not have the scope for development: those of Dickens do. “This is our friend’s consulting room (or would be, if he ever prescribed), his sanctum, his studio,” said my guardian to us. Quiet unexpectedly, Dickens combines here the adult-child motif with a rather different one from earlier in the novel – that of Miss Flite’s captive birds, waiting for the Day of Judgement to be set free. Entire theses can be written – and, I’m sure, have been written – about Dickens’ use of symbols and motifs. For all its comic exuberance, Bleak House remains a tragic novel. There can be no entirely happy ending. Yes, young lovers do get to marry each other – as they had done at the end of Dickens’ earlier works – but there can be no happy-ever-after: life is too complex to allow for that. It is too inscrutable. There are signs and symbols a-plenty – if only we knew how to interpret them. There will be some fun and games in LitBlogLand this Christmas. Firstly, there’s a celebration of Dickens this Christmas (see here and here), kindly organized by Delia at the blog Postcards from Asia, and by Caroline at the intriguingly named blog Beauty is a Sleeping Cat. There are quite a few points in all that, which I won’t bother to summarise (it’s much easier clicking on the links above!) – but amongst other things, I have signed up to write a post about any book by Dickens, or to do with Dickens; and also write a review of a film based on a work by Dickens. A pleasure. Somehow, this season seems made for this writer: some time over the next week or two, I shall find an afternoon to sit by the open fire in my local pub with a drink in hand, and read A Christmas Carol. There really isn’t a better Christmas treat. Meanwhile, over at Guy’s blog (His Futile Preoccupations) and at Emma’s blog (Book Around the Corner), there’s another fun idea: “copinautes”. (Emma explains here what this means.) Once again, without going into details, I am to make a virtual Christmas present of two books to a fellow book blogger – in my case, Brian Joseph of Babbling Books. And he has similarly to make a virtual present of two books to me. And we have undertaken to read these books over the course of the coming year – and, presumably, to comment on them. Meanwhile, both Guy and Emma will be making virtual presents to each of us. The titles will, I believe, appear on our respective blogs on Christmas Day. And, since I have no intention of logging in on that day, I shall have to use the facility developed by those lovely people at WordPress, whereby one may publish posts at a specified date and time. I hope it works! In the words of Joe Gargery – what larks!